She is out to make us all overdose on chocolate. The Yankee bought me her cookbook for Christmas and it’s fantastic. 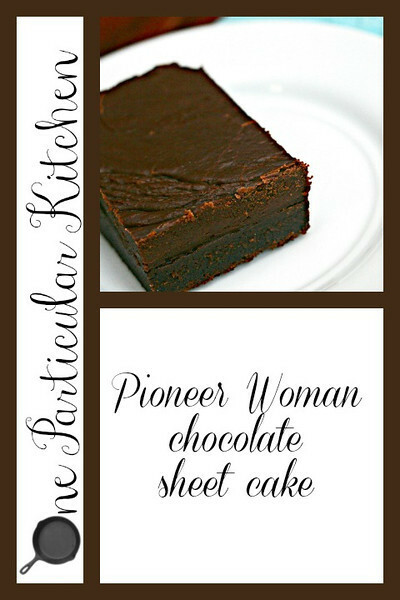 This chocolate sheet cake (also on her site here) was the first recipe I tried out of the book and it certainly didn’t disappoint! Try it yourself. Add boiling water to saucepan and boil mixture for 30 seconds, then remove from heat. Pour this mixture over the flour mixture and gently stir to cool it off. Nutritional information: one bazillion calories (roughly) per serving. And worth it. Isn’t it divine? It’s my go-to whenever I need to make a cake! Looks like a fudgy brownie! Oh wow, that looks like my kind of chocolate cake (i.e., dense and fudgy). I had thought her chocolate sheet cake was just a basic Texas sheet cake, and the varieties of those I’ve had have been much lighter (almost like a cocoa color). I think I’ll have to give Pioneer Woman’s version a try. Very much so. Definitely give it a try! I’ve been dying to try that since I saw it at Ree’s site, it looks so good. I couldn’t make it at my old place because the oven was too crappy, thanks for reminding me about it! MAKE IT. It’s so freaking rich. It’s fabulous. I think I’m going to make this today with Pippa. Did you use regular or Dutch-processed cocoa? This cake is just the best! I leave out the pecans too…nothing between me and my chocolate!